With the M-Track 2X2, you can create flawless 24-bit/192kHz studio-quality recordings with an intuitive and easy-to-use audio interface. 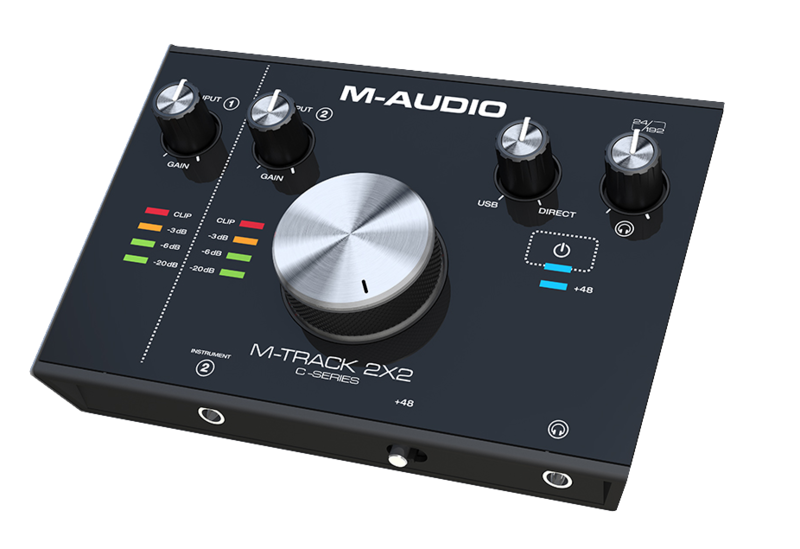 This article walks through a number of frequently asked questions about the M-Audio M-Track 2X2. How do I connect the M-Track 2X2 to my computer? Do I need a power supply? Do I need a driver to use the M-Track 2X2? What sample rates does the M-Track 2X2 support? The instrument input is not working. Why not? How much does it weigh and what are the dimensions? The M-Track 2X2 comes with a USB-C to USB-C cable as well as a USB-C to USB-A cable to ensure that it can connect to all current and future available USB connections available. USB-C is the hot, new industry standard connector and cable used for connectivity and power. For more information on USB-C connections, check out this great article. There is no difference in the audio quality between the USB-A, B, or C connections. The M-Audio M-Track 2X2 simply uses the USB-C connection because it is becoming the industry standard USB connection type. The M-Track 2X2 is USB hub-powered meaning that it is powered simply by connecting it to your computer with the included USB cable. No additional power connections are necessary. For a Windows operating system, the M-Track 2X2 requires the installation of drivers to ensure the best possible performance. For Mac operating systems, the M-Track 2X2 is class-compliant and does not require a driver installation. The M-Track 2X2 supports up to 24-bit and 192kHz studio quality sample rates to capture every nuance and subtlety of your performance. The M-Track 2X2 weighs about 2 pounds and the dimensions are approximately 8" x 6" x 2.75" (L x W x H). First, ensure that the USB / DIRECT knob is not all the way to one side or the other. In most cases, you will want a blend of direct sound and audio from your computer. Next, in your preferred Digital Audio Workstation, set the track that you are attempting to play/record into to channel 2. Most DAWs default to channel 1 and the instrument channel on the M-Track 2X2 is set to send on channel 2. If you continue to have difficulty, reach out to M-Audio support for additional assistance. Whether you are a customer or dealer, if you already own an M-Audio product, or if you just have pre-sales questions, the M-Audio technical support team is available to help!